In for repair is a 2 weight cuckoo clock. 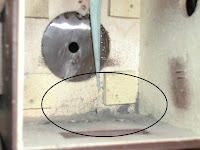 The interesting feature of this repair is that there was so much fuzz inside the case and on the wheels. 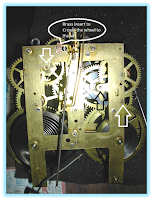 The first image is inside the case with the movement removed. Notice the fuzz on the lower right side of the case. How does this happen? Disassembled movement with pivot holes marked. With all clock overhauls, pivots are checked for smoothness, clicks checked, the suspension rod is polished. Here we have a nice Junghans time & strike mantle clock. The problem description is the clock runs for a few minutes then radically stops. The clock was recently oiled with penetrating oil instead of regular clock oil. This oil must be removed. The movement will need at least a complete disassemble and cleaning. While the customer was dropping off the clock, he demonstrated how the clock would stop and the angle of the pendulum rod was cocked. This would imply a bent escape wheel tool. We will see if this is the case. 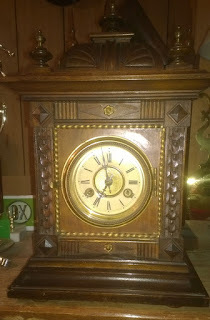 Here we have a Sessions mantle clock needing repair. From the initial observation the previous repair job was not done correct. I suspect the repairman did not have the proper tools. Notice the brass addition at the top of this picture. The previous repairman crowded the escape wheel hole with a piece of brass instead of installing a new brass busing. The front plate along needed 7 bushings. And the back 8. Here is the clock completely torn apart. There were 15 warn pivot holes that needed repair. 5 clock wheel pivots that needed polishing. The mainspring clicks and click springs were in good working order. The mainsprings, although slightly set, are sufficient to power the clock. The leather in the hammer was old and small. This was replaced with old new stock leather.